Like my mother, my father was a fantastic cook. He was highly innovative and often made up recipes, trying them out on us. Most of the time they worked; occasionally, they didn't. Sadly, despite constant nagging, he never wrote down anything he cooked so the recipes were usually one-off's. 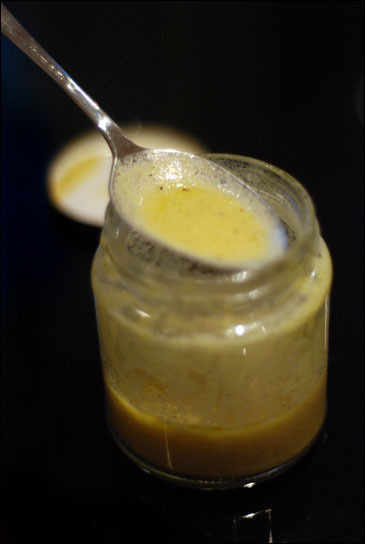 One thing he did impart though, was his vinaigrette recipe, which I think is still the best I've ever tasted. It's extremely easy too. Place all the ingredients in a jar, screw on the lid and shake vigorously until you have an emulsion. And there you have it. Vinaigrette. It will keep for up to 6 weeks in the fridge. Don't worry if your vinaigrette separates again, just make sure the lid is securely on and give it another shake. I'm printing this out for Marc since he's on a proper dijon mustard fetish at the moment.